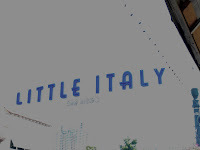 Scout and I went to Piccolo Italia (Little Italy) today to pick up a few of my favorite things - pasta e gelato. It is still very warm here in San Diego, California so our first stop was at Cafe Italia per gelato espresso. Scout waited patiently. If you are wondering whether I looked silly taking pictures of my dog while standing in line here, I did, but really, who cares. The Italians have a saying, "No te preoccupare" (which literally translates to "Don't preoccupy you" or non-literally, "No worries") and is always accompanied by a shrug of the shoulders and a tsk sound as though to say, well, "Who cares. Life is short. Enjoy ...". 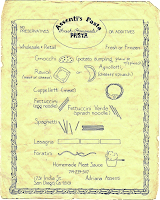 Next, Assenti's Pasta where I bought fatto a mano (hand-made), gluten-free linguini. This pasta is made from CeCe (chickpeas) which is pronounced che-che in Italian - another fun word to say. Take a look at their website for recipes like portobello ravioli con salsa di noci (mushroom ravioli with walnut sauce). This shop was started by Adriana e Umberto Assenti and is now managed by their handsome sons, Roberto e Luigi. It is always a pleasure to be assisted by a handsome Italian man. Our last stop was the Chiesa Cattolica. 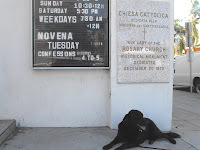 We sat on the shady steps outside Our Lady of the Rosary so we could fully enjoy the last of the gelato which Scout finished up. On the first Sunday of every month at noon the entire mass is delivered in Italian. Even if you don't parla Italiano and you are not Catholic, it's lovely. The church is always full with at least three and sometimes four generations of Italian speaking families. (We (informal) will speak to one another soon). Nancy Offerman of Live-Laugh-Love (or Vivere-Ridere-Amore) won La Mappa di Italia pillow. 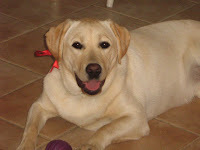 Nancy is represented here by her yellow Lab, Logan. My husband's uncle recently lost his wife of 52 years. He stays with us for a couple of days each month when going to visit his children (we do the airport trip) and the visits are great for all of us! This week I made him his favorite dinners, and he came carrying red and white wine! Good food, company, conversation! Grace given, grace received! Love the pillow with your pup wrapped around it! I introduced the newest member of Assisi Farms fourteen days ago as "No Name Lab". He came to us on a Friday and by the end of Saturday he did not respond to the name I was told he came with, Kenyon. On Sunday, however, he did. Look at the difference in the photographs from the first few days and this evening. My responsibility is to evaluate him and assist in the regaining of confidence and manners. Tonight was the first time I allowed him off-leash at Coronado's Dog Beach. He has become attached to Scout, my youngest black Lab, but she remains ambivalent about him given her mood which is her way. As I watched them play together on the beach this evening I was overcome with the evidence of Grace Given and Grace Received. Although he remains close to me and looks to see where I am, I saw in him the beauty that defines his soul long before vicious dog attacks and irresponsible previous owners. As he ran into the Pacific Ocean and played with Scout and other dogs with no fear his scars were still physically noticeable but in those moments, only to me. As he played I experienced joy and was moved accordingly. Never forget the healing power of the giving of your time or the kindness of a gesture well timed nor of allowing in the experience of being present in the moment. Grace given and grace received. I am in search of a non-copyrighted map of Italy and will make this copyrighted map of Italy pillow a gift to you in exchange. This pillow e fatto a mano (is made by my hand) and measures 14 x 12, is down-stuffed and printed on burlap di espresso (darker burlap). Ma aspetta volgio piu (but wait, I want more). Because I adore the phrase, concept, practice of Grace, I want to hear how you offered or were given Grace in your life this week. The pillow is actually yours for the map ma Grazia (but Grace) "will lead you home". You can comment here or send an e-mail through the website if your share is too personal. I will share all the entries in some format next week and announce the winner at that time.